Lee University hosted its first annual “48-Hour Film Friendsy.” Lee’s Matthew Fisher, associate professor of communication, and Beecher Reuning, assistant professor of cinema, organized the event, which brought in 33 students from six different majors and all years. After a weekend of work, the teams each successfully completed a 4-6 minute film. The screening and awards party brought in over 70 attendees. 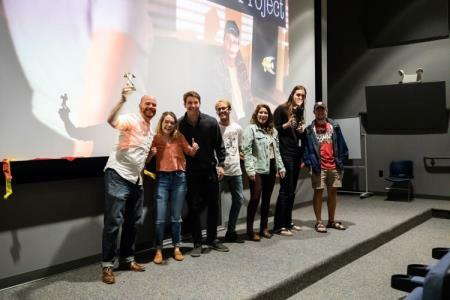 Each film was judged by a panel consisting of Chris Golden, director of IT operations; Erin Looney, university registrar; and Dr. Jared Wielfaert, associate professor of humanities. The judges celebrated each team’s work and gave out two awards to the highest-achieving films. 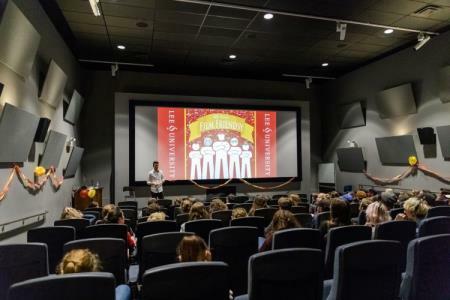 Lee’s cinema faculty assembled five teams of student filmmakers and assigned each a coach. The volunteer coaches included Dan Buck, associate professor of theatre; Clark Campbell, Lee alum and communication coach; April Reuning, adjunct professor at Lee; Jeff Salyer, director of media services and assistant professor of communication; and Stephanie Valadez, adjunct lecture at Lee. Mr. Buck's team won the top prize with its film “Oliver’s Project,” which was under the time-travel genre. The team consisted of Lee students Jon Bouvier, Kellen Gifford, Colleen Hutchinson, Nate Richardson, Noah Rodden, and Olivia Webb. For more information on Lee’s Department of Communications, call 614-8341 or email communicationarts@leeuniversity.edu.